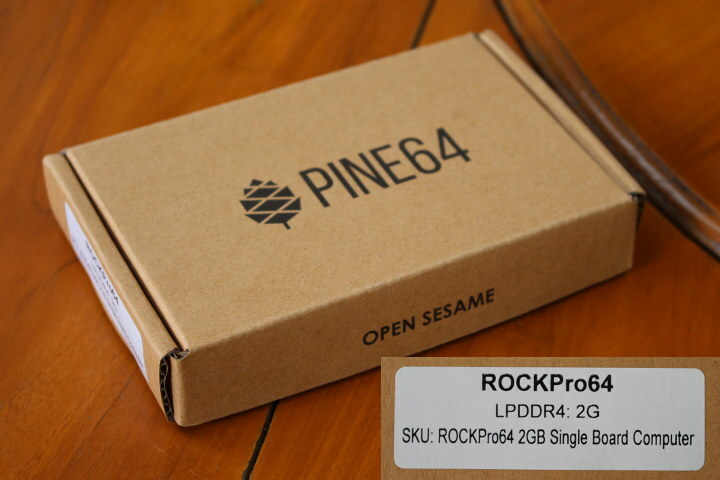 Let’s do one more RK3399 Linux review using Pine64 RockPro64 development board. After shortly checking out the hardware, I’ll test Ubuntu 18.04 “Bionic” LXDE on the board, test 3D graphics acceleration, video playback, USB storage and network performance among other things on the board. The board came in a cardboard package, and the sticker made it clear I had received the 2GB LPDDR4 version. 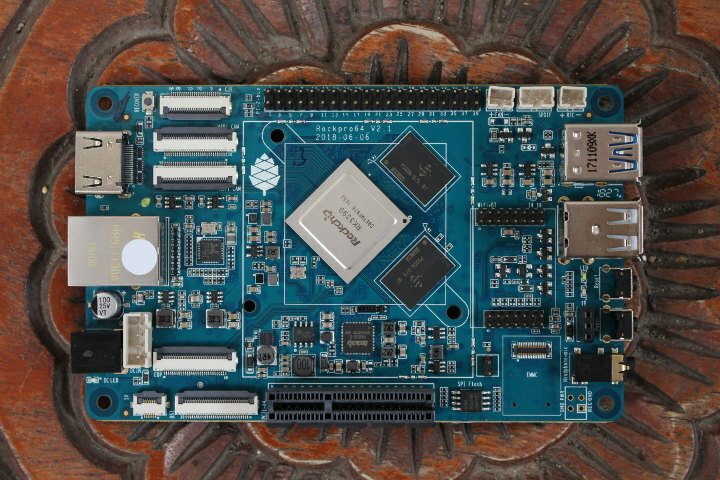 Even after FriendlyELEC NanoPi M4 announcement, Rockchip ROCKPro64 is still the cheapest RK3399 development board around, so it should come as no surprise that the board does not come with any accessories by default. Another way to keep the price low was not to include any built-in storage apart from SPI flash, so instead most people will either boot from micro SD card or an eMMC flash module both of which need to be purchase separately. 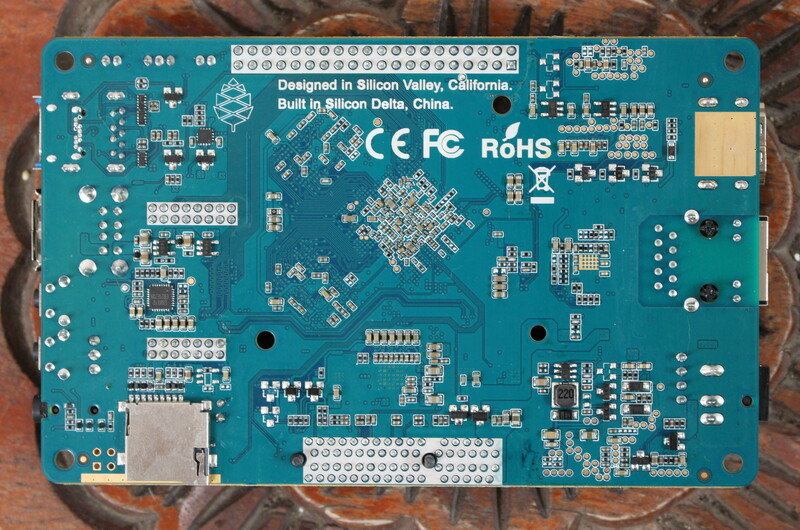 Another cost-saving is the lack of built-in wireless module for WiFi and/or Bluetooth connectivity, which makes sense as FCC certification is easier that way, and the board is cheaper for people who do not need WiFi. WiFi can be added via Pine64 802.11ac 2×2 + Bluetooth 4.2 module ($15.99 – Ampak AP6359SA), or USB. The power supply is not included either, and you’ll need a 12V/3A or greater, especially if you connect power-hungry devices to the USB 3.0 port and/or the PCIe slot, in which case a 12V/5A power supply is recommended. The latter is an exclusivity for RockPro64 as I can’t remember seeing it on any other RK3399 maker boards. 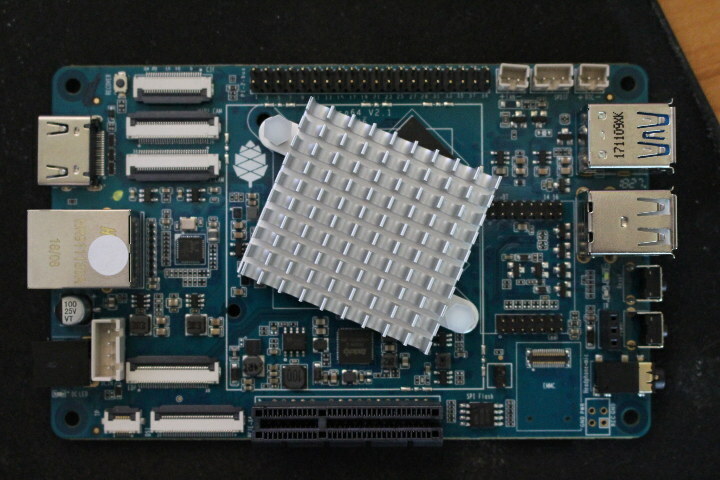 I won’t test PCIe myself in this review since I don’t have any compatible card, but Pine64 provides card mostly for storage with a PCI-e to Dual SATA-II Interface Card ($9.99) and a PCI-e X4 to M.2/NGFF NVMe SSD Interface Card ($5.99). Note that Rockchip RK3399’s PCIe interface is not suitable for graphics card since addressable memory is limited to 32 MB. There’s not much to see on the bottom of the board except for the micro SD card and Everest Semi ES8316 audio codec. 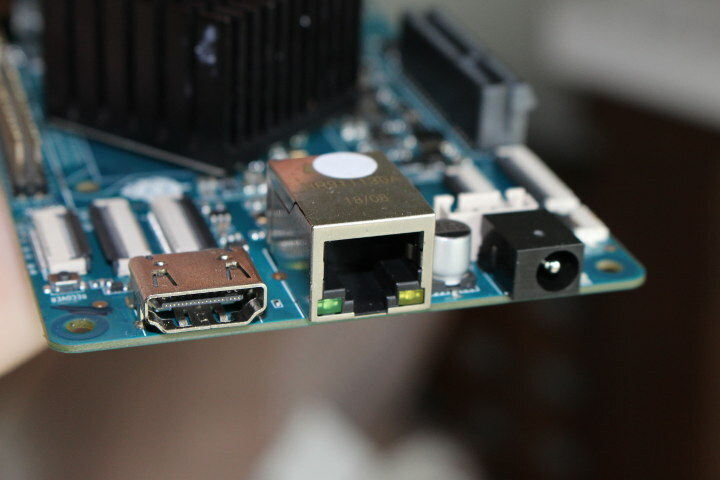 It’s also interested to look at the sides fo the board, especially with regards to the USB 3.0 + USB type-C connector which I don’t think I have seen in the past. 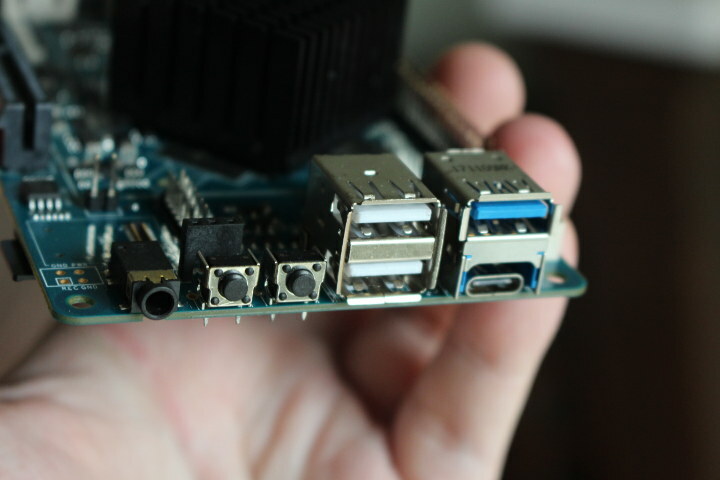 The other side is more “traditional” with an HDMI 2.0 port, RJ45 connector for Gigabit Ethernet, and the DC jack. Since I’ve tested five Rockchip RK3399 development boards so far, I thought it would be interested to take a photo of all five models to compare the form factors. From top left to bottom right: RockPro64, NanoPC-T4, Videostrong VS-RD-RK3399, AIO-3399J, and Firefly-RK3399. 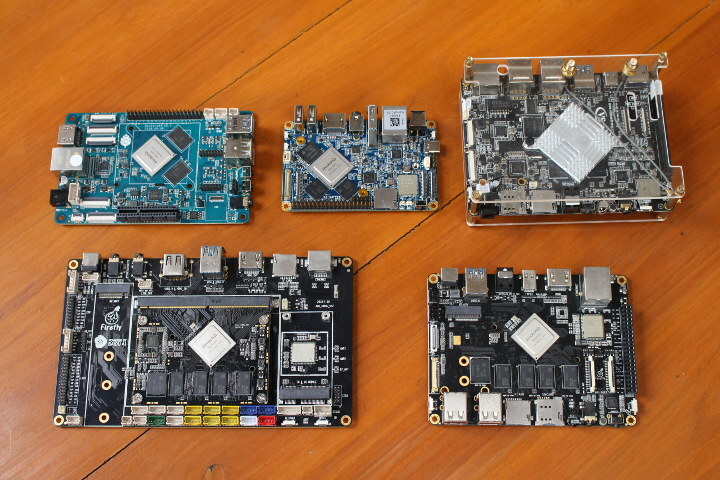 The smallest of the lot is NanoPC-T4, but now we have a smaller board with business card sized NanoPi M4 board, and soon an even smaller RK3399 SBC with the upcoming NanoPi NEO4. I first try the same heatsink as used in AIO-3399J review, and it was close but no cigar, so instead I went with another thicker heatsink and some old thermal paste. I connected Ethernet, HDMI, USB key board and mouse, as well as USB 3.0 drive, but I did not connect a USB-C adapter with HDMI output just yet, since it caused issues with other boards (HDMI disabled when USB-C DisplayPort Alternate mode is enabled). I also connected a serial debug board as explained in Pine64 forums. But first we need to get some firmware to play with. 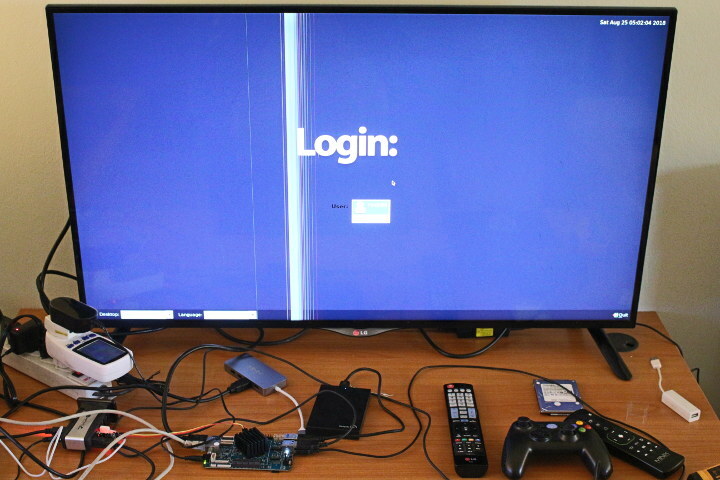 News about Ayufan firmware images is also reported in the forums, so I went to Github release page and download one of the latest stable image, currently v 0.7.9 with bionic-lxde-rockpro64-0.7.9-1067-arm64.img.xz. I flashed the image to a 16GB micro SD card using Etcher, inserted the micro Card into the board, connected the power, some light turned on, and …nothing. I connected the serial console using 1.5 Mbps 8N1 no flow control and no output in the serial console. I took out the micro SD card, and pushed it back in the socket, and … success! I would get a login prompt in the HDMI display for Rock64 and in the serial console. Default username/password for RockPro64 images are: rock64/rock64. [ 0.003285] Yama: becoming mindful. [ 0.127677] SMP: Total of 6 processors activated. [ 0.194580] hw-breakpoint: found 6 breakpoint and 4 watchpoint registers. [ 0.510725] Advanced Linux Sound Architecture Driver Initialized. [ 0.566584] RPC: Registered named UNIX socket transport module. [ 0.566607] RPC: Registered udp transport module. [ 0.566625] RPC: Registered tcp transport module. [ 0.566643] RPC: Registered tcp NFSv4.1 backchannel transport module. [ 0.895066] Installing knfsd (copyright (C) 1996 okir@monad.swb.de). [ 0.904828] tz_tee_probe: name="armv7sec", id=0, pdev_name="armv7sec.0"
[ 1.060354] 0x000000000000-0x0000003f8000 : "loader"
[ 1.061722] 0x0000003f8000-0x000000400000 : "env"
[ 1.062972] 0x0000007c0000-0x000000800000 : "vendor"
[ 1.065831] rk_gmac-dwmac fe300000.ethernet: clock input or output? (input). [ 1.066475] rk_gmac-dwmac fe300000.ethernet: TX delay(0x28). [ 1.067004] rk_gmac-dwmac fe300000.ethernet: RX delay(0x20). [ 1.067534] rk_gmac-dwmac fe300000.ethernet: integrated PHY? (no). [ 1.250724] fan53555-regulator 0-0040: FAN53555 Option Rev Detected! [ 1.253929] fan53555-regulator 0-0041: FAN53555 Option Rev Detected! [ 1.305554] rockchip-thermal ff260000.tsadc: tsadc is probed successfully! [ 1.319975] dwmmc_rockchip fe320000.dwmmc: IDMAC supports 32-bit address mod. [ 1.320663] dwmmc_rockchip fe320000.dwmmc: Using internal DMA controller. [ 1.322794] dwmmc_rockchip fe320000.dwmmc: 'clock-freq-min-max' property was. [ 1.397831] Netfilter messages via NETLINK v0.30. [ 1.402956] bridge: automatic filtering via arp/ip/ip6tables has been deprec. [ 1.408950] [WLAN_RFKILL]: wlan_platdata_parse_dt: enable wifi power control. [ 1.409592] [WLAN_RFKILL]: wlan_platdata_parse_dt: wifi power controled by g.
[ 1.410343] [WLAN_RFKILL]: wlan_platdata_parse_dt: get property: WIFI,host_w. [ 1.412905] [BT_RFKILL]: bluetooth_platdata_parse_dt: get property: uart_rts. [ 1.413691] [BT_RFKILL]: bluetooth_platdata_parse_dt: get property: BT,reset. [ 1.414435] [BT_RFKILL]: bluetooth_platdata_parse_dt: get property: BT,wake_. [ 1.415188] [BT_RFKILL]: bluetooth_platdata_parse_dt: get property: BT,wake_. [ 1.417362] [BT_RFKILL]: bt_default device registered. [ 1.619169] [drm] Supports vblank timestamp caching Rev 2 (21.10.2013). [ 1.619855] [drm] No driver support for vblank timestamp query. [ 1.967827] usb usb4: We don't know the algorithms for LPM for this host, di. [ 1.999645] xhci-hcd xhci-hcd.5.auto: Host not halted after 16000 microsecon. [ 2.000583] xhci-hcd xhci-hcd.5.auto: Host controller not halted, aborting r.
[ 2.113226] usb usb4: We don't know the algorithms for LPM for this host, di. [ 3.116881] I : [File] : drivers/gpu/arm/midgard/backend/gpu/mali_kbase_devf. [ 3.665604] rockchip-pcie f8000000.pcie: PCIe link training gen1 timeout! [ 7.105959] cgroup: cgroup2: unknown option "nsdelegate"
[ 7.167131] systemd: Detected architecture arm64. [ 7.192928] systemd: Set hostname to <rockpro64>. [ 7.655629] systemd: File /lib/systemd/system/systemd-journald.service:36. [ 8.007891] systemd: Started Forward Password Requests to Wall Directory . [ 8.035131] systemd: Started Dispatch Password Requests to Console Direct. [ 8.048804] systemd: Created slice System Slice. [ 8.061505] systemd: Listening on Journal Audit Socket. [ 8.074560] systemd: Created slice system-serial\x2dgetty.slice. [ 8.087130] systemd: Listening on /dev/initctl Compatibility Named Pipe. [ 8.100213] systemd: Listening on Journal Socket (/dev/log). [ 8.113090] systemd: Listening on udev Kernel Socket. [ 8.125167] systemd: Listening on udev Control Socket. [ 8.138024] systemd: Started ntp-systemd-netif.path. [ OK ] Started ntp-systemd-netif.path. [ 8.150502] systemd: Created slice User and Session Slice. [ 8.162864] systemd: Reached target Swap. [ 8.174850] systemd: Reached target Slices. [ 8.186814] systemd: Reached target System Time Synchronized. [ 8.199268] systemd: Listening on Journal Socket. [ 8.264543] systemd: Starting Create list of required static device nodes. Starting Create list of required st…ce nodes for the current kernel. .
[ 8.407346] systemd: Listening on Syslog Socket. [ 8.435022] systemd: Reached target Remote File Systems. [ 8.447059] systemd: Reached target Local Encrypted Volumes. [ 8.463362] systemd: Started Remount Root and Kernel File Systems. [ 8.475031] systemd: Mounted Kernel Debug File System. [ 8.487447] systemd: Mounted Huge Pages File System. [ 8.499133] systemd: Started Create list of required static device nodes . [ OK ] Started Create list of required sta…vice nodes for the current kerne . [ 8.510504] systemd: Mounted POSIX Message Queue File System. [ 8.522343] systemd: Started Set the console keyboard layout. [ OK ] Started Set the console keyboard layout. [ 8.536459] systemd: Started Restore / save the current clock. [ 8.542886] systemd: Started Load Kernel Modules. [ OK ] Found device /dev/ttyS2. [ OK ] Found device /dev/disk/by-label/boot. [ OK ] Started Message of the Day. [ OK ] Started resolvconf-pull-resolved.path. [ OK ] Started ntp-systemd-netif.service.